Olive oil tasting, and Dinner. Olive oil, is the best oil in the world. Let us learn how to find out which olive oil is good. 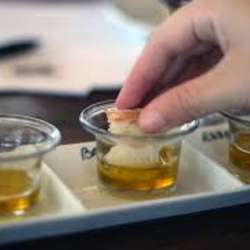 Let us do a tasting to be able to destinguish the differences in olive oils. A worldwide gold medal Olive Oil producer Ali Erten will give us all these details in his workshop. This will be followed by a 3 course dinner. The price for the dinner is 75 TL. + drinks. Please make reservations if you are sure to attend as seating arrangment will be done.The dress code is SMART CASUAL, gents with jackets.